Chicken Wings Recipe made fresh and crispy. This recipe is fantastic and really easy to make. Want quick and easy fried chicken wingsfor the big game or just for everyday dinners follow this recipe to make it delicious with new flavors. Remove thawed chicken wings and place in container. Coat wings lightly with Olive Oil or milk. Pre-mix Panko bread crumbs with Jake's California Chipotle, Santa Barbara or Tri-Tip style Dry Rubs. Dip chicken wings in bread crumb and dry rub mixture. Heat cooking oil in cooking pot or oil frying container until it reaches 360 degrees. 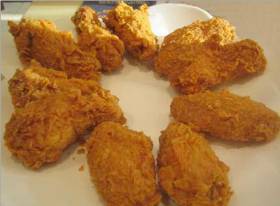 Carefully drop breaded chicken wings into heated oil and cook until wings are golden brown approximately 170 degrees. Remove from cooking container and place in basket or on paper towels to drain excess oil. Allow wings to sit for at least 2-5 minutes before serving. Place Chicken Wings in a basket or on plate and serve. Wings will be crispy and full flavored ready to serve.